Uncharted 3: Drake's Deception will draw inspiration from the life of T.E. 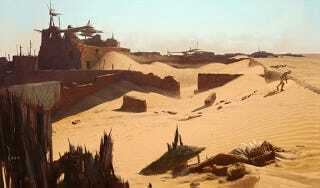 Lawrence's days as an archaeologist in the deserts of the Arabian Peninsula when it hits the Playstation 3 late next year, Entertainment Weekly reports. The magazine reports that the game will play with the theme of deception while also focusing on Nathan Drake's relationship with father figure Victor "Sully" Sullivan. Of course, the game also has the daring treasure hunter doing what he does best: Looking for some lost and fabled loot. This time around Drake will be hunting through the Rub' al Khali Desert searching for a legendary lost city in the sifting sands. Naughty Dog tells EW that they chose the desert (a location rumored since last month) because they wanted to deal with the challenge of animating the fluid landscape. They join Jager Entertainment and Spec Ops: The Line in that desire to play with sand animation. Rumor: Is Uncharted 3 Going To The Desert? There's a bit more in the story, like the inclusion of "backward climbing" and the ability to fight multiple people at once. Naughty Dog also promises to continue their work on the game's still-not-quite-all-there multiplayer.